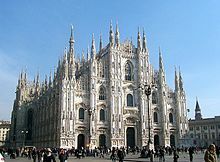 Milan Cathedral is the cathedral church of Milan. Dedicated to St Mary of the Nativity (Santa Maria Nascente), it is the seat of the Archbishop of Milan, currently Cardinal Angelo Scola. The Gothic cathedral took nearly six centuries to complete. It is the largest church in Italy (the larger St. Peter's Basilica is in the State of Vatican City) and the fifth largest in the world. This article uses material from the Wikipedia article "Milan Cathedral", which is released under the Creative Commons Attribution-Share-Alike 3.0 License.